I always enjoy the weeks that Bob Roberts preaches at JBC, as on Friday nights he gives the service over to testimonies from the campers. It’s always encouraging to hear how God has worked in the lives of the campers. Many were saved this week at JBC and many others were convicted about specific sins. There’s also often an element of humor in these services as well, as it’s always somewhat unpredictable what a kid will say behind the microphone. But Bob uses even those elements to further explain truth from God’s Word to the kids. But back to the interesting happenings. I forget if I mentioned last week about discovering that our primary effect lighting fixtures at JBC were in need of some serious repairs toward the end of last week. If you saw the JBC funtime/game show last year, you’ll probably remember the cool moving lights that we use for it. Well, those were the lights that were in need of repair/replacement. So my boss Rich and I stayed of up late one night last week trying initially to repair the fixture and when discovering that it was impossible, to find a suitable replacement that could be ordered as those fixtures are no longer sold. They arrived Tuesday afternoon, which gave me one more late night to get them mounted and then program them for the funtime/game show on Wednesday. Needless to say it was not our most flawless funtime ever, but the Lord was good and most of the “mistakes” were evident only to us and not the kids. And thankfully, the new lights performed very well. God was good in that I was able to transfer most of the programing from the old fixtures to the new ones with only some minor adjustments. We sent the others out to California to be repaired and when they get back I’ll have four cool lights to play with, err.. utilize effectively. Interesting happening #2 for the sound department occurred on Thursday toward the end of our carnival out on the ballfield. About 5 mins before the end of the carnival, the amplifier for our sound system basically died, so all you could get out of it were cu- of- -oun- li- -s (“cut off sounds like this”). Since we had another game on the ballfield Friday morning, I had to borrow some equipment from teen camp and my station wagon filled in as an improvised sound car (see picture above). But that’s ok, because camp life makes us very versatile, right? 😛 But again, God was good in that teen camp had some equipment they weren’t using at the time, and I had time to discover the problem and implement a solution that worked. 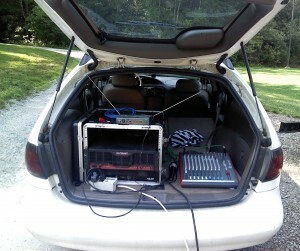 My station wagon as a "sound truck"
Each week, as most of you may be aware, the camp pairs up each op staff member (me) with a counselor as prayer partners. This week my prayer partner was actually one of my Greek students from this last semester so that was an interesting and enjoyable “role-reversal” of sorts. There are actually three of my Greek students on summer staff this year, and lots more of my students from the freshmen and sophomore classes I did grading for. I have a hard time getting them to call me “Andy” here at camp, instead of “Mr. Anglea” like they’re supposed to do at school. (And if any of you are reading this, it really is OK to call me Andy! 😛 ) I really enjoy the ministry I’m able to have with my prayer partners, especially having already experienced the other side of the prayer partner relationship in previous years as a counselor. Both of us are able to learn from each other. Well, this coming week the teen camp speaker will be Dave Young, who I don’t believe I’ve heard before so I’ll have to try to get down to a couple of the teen camp services if possible. The JBC speaker will be Ron DeGarde, who I haven’t heard in several years, so I’m looking forward to hearing from him again. Please pray that this week will be less “eventful” than last, Lord willing. Thanks again for your prayers!